Technology moves FAST. As a technology company, we're always looking to stay innovative and see how new technology can be used to benefit you, the acupuncturist, and your practice. Chatbots have been in the news lately. Many companies, like Facebook, are giving developers the ability to create chatbots. Chatbots allow brands to automate interactions and "chat" with users through messages. What this means is that Facebook users can now chat with a company or brand as if it was a live person. 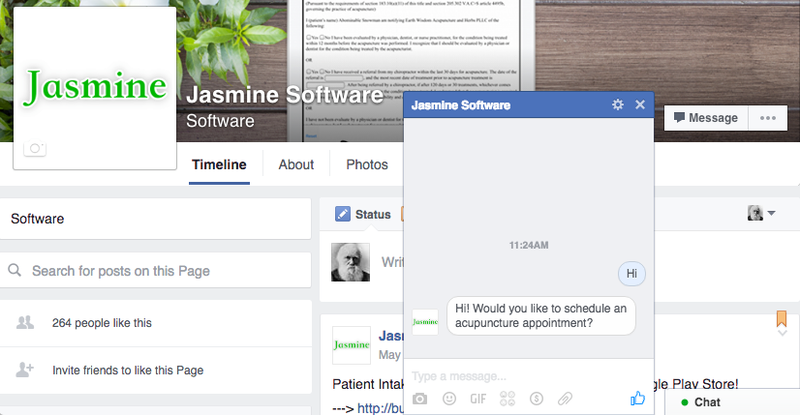 As an example, consider the image above and cropped below, this is a quick prototype I put together of me (the patient) chatting with the Jasmine Facebook Page (the clinic). 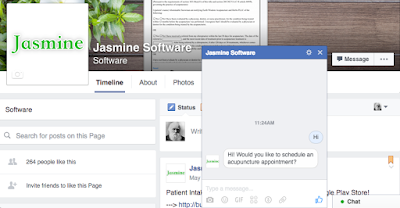 The idea is acupuncture patients can chat with "someone" at the clinic and schedule an acupuncture appointment, all within Facebook and with natural language, as if talking to a live receptionist. 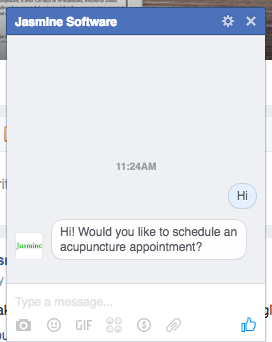 With chatbots and artificial intelligence, we're able to streamline and make the acupuncture practice more efficient. What now? I'm gauging interest, if you are interested and would like to be the first to be notified and use the acupuncture chatbot, I encourage you to signup for the private invite by following the link below.